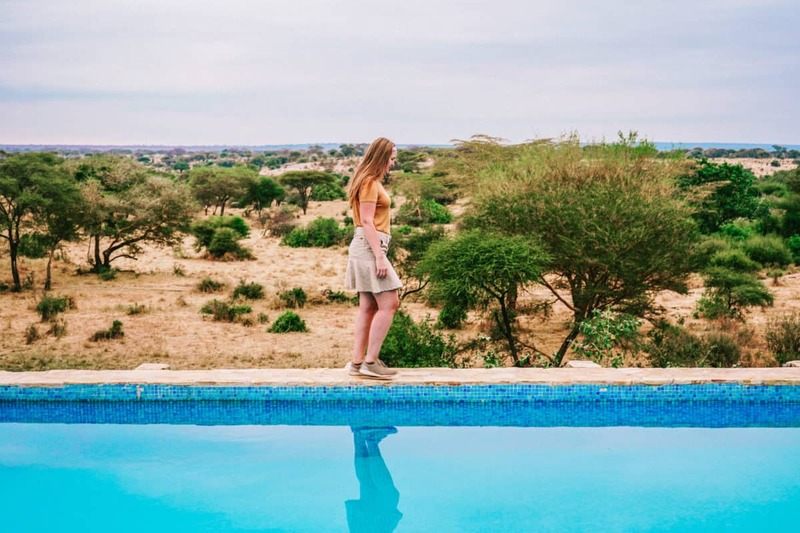 It’s been a while since I posted on the blog and that was for a good reason (and also not a very good one) – we’ve been in Africa! Our 7-day African safari started in Kenya and finished.. well, in Kenya as well. But our safari tour ended in Arusha, Tanzania. We visited 5 parks in 7 days, and that was incredible! 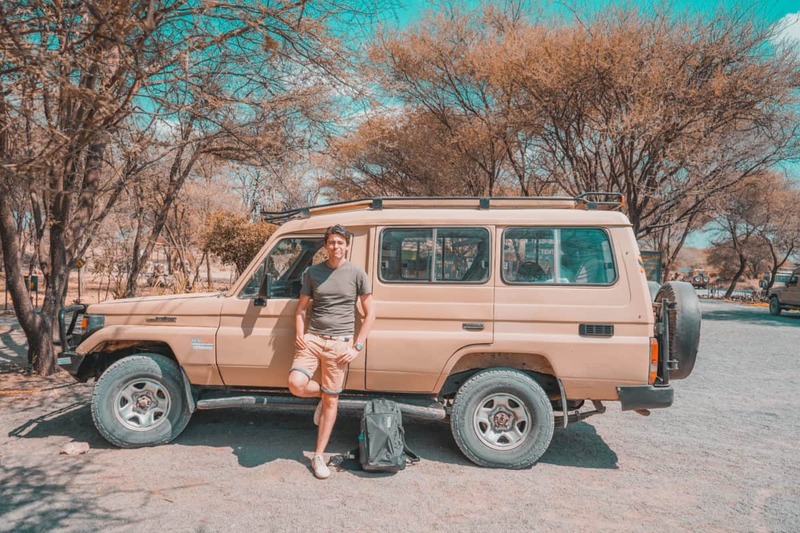 So well, in this post, I will tell you about our 7-day safari in Kenya and Tanzania and my impressions from Eastern Africa! We originally bought our flights with KLM. However, we were notified, that the carrier changed to Kenya Airways. I never had a flight with Kenya Airways before, so I was excited (it’s always exciting for me to try out new airlines). The flight was about 8 hours long, and the seats were nice and comfy. Every seat had an in-flight entertainment system, but the touchscreens definitely need renovation, as during both flights (there and return) and also, embarrassingly, the food wasn’t enough! It’s the first time in my life when the meal on the plane wasn’t big enough to keep me full. They also didn’t sell snacks on board, so it was a very hungry flight, I’d say. There are more airlines that fly to Kenya and Tanzania. You can check the availability & price for your dates here. We were flying during the day, so we arrived at night, transferred to the airport hotel Hilton Garden Inn (I loved it) and in the morning, waited for our safari driver to arrive at 7:30 am. The reason I’m not talking about how we picked our tour and how much it was is that I basically want to write a separate post about it as well a post about what to pack for a safari and the ideal 7-day safari itinerary for Kenya and Tanzania, so stay tuned, once they are ready, I’ll link them here! 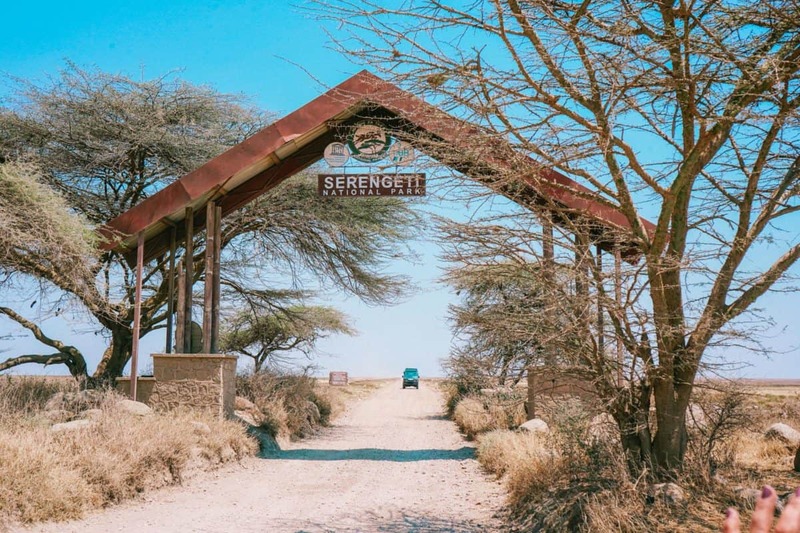 At around 12 pm, we arrived at our first lodge – Amboseli Sopa Lodge. I liked the lodge because it had a big territory, stunning views over Kilimanjaro and a fantastic buffet for breakfast, lunch and dinner. 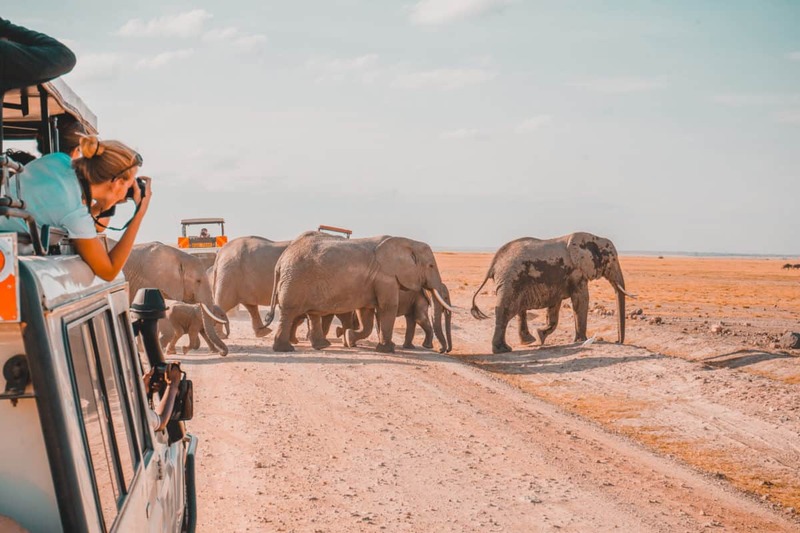 That said, we spent two nights of our 7-day Safari in Kenya and Tanzania in Amboseli Sopa Lodge and had two rides into the Amboseli National Park. I will probably write a separate article about the Amboseli National Park. However, it’s very famous for its elephants. 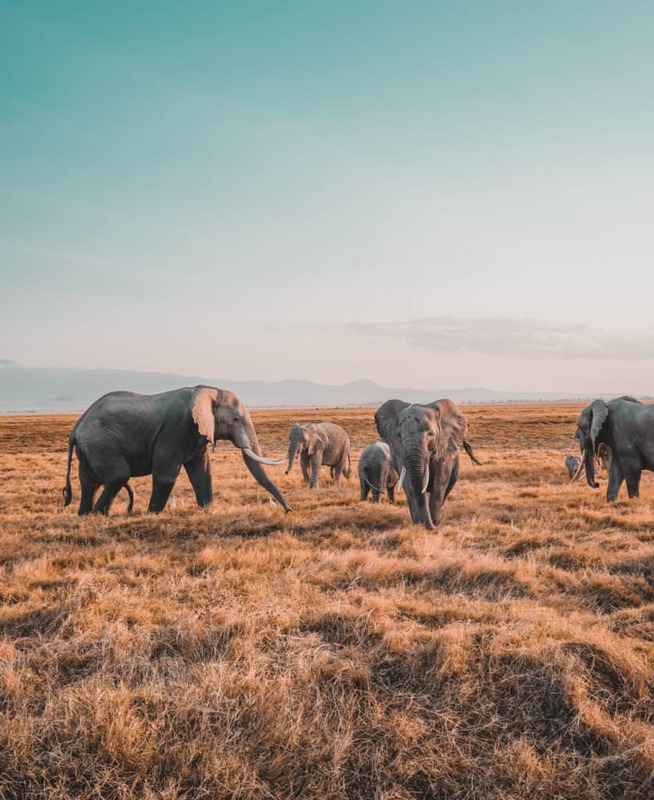 There are over 1300 elephants in Amboseli, and I’m pretty sure we saw them all (I’m exaggerating, but we DID see a lot of elephants). 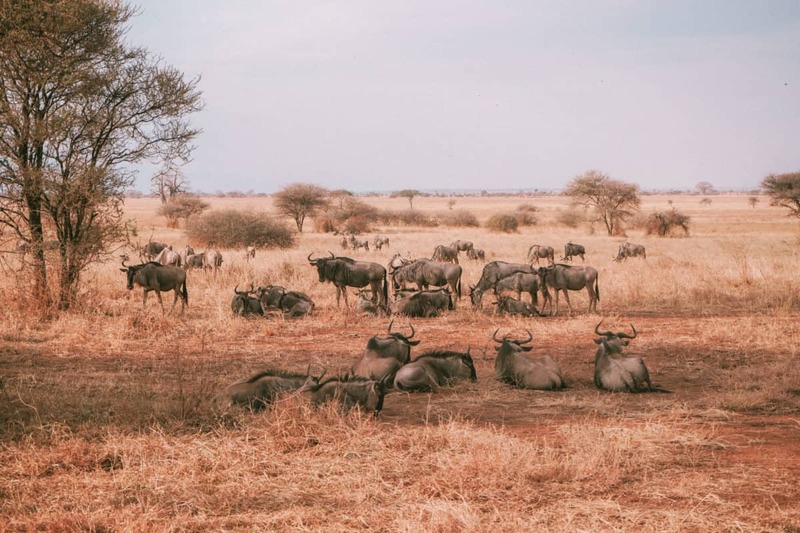 Out of big five African animals to spot during a safari, we only saw 3 in Amboseli: buffalos, elephants and lions (we didn’t see a rhino or a leopard there, which is not surprising). 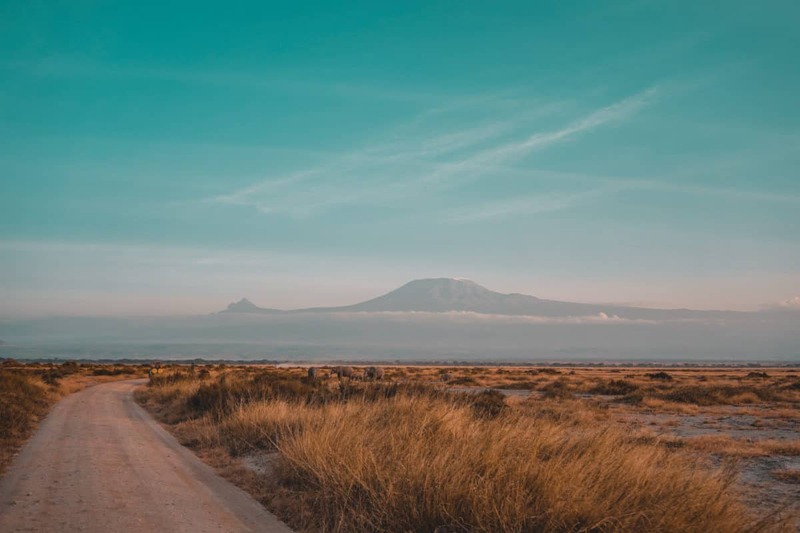 However, we enjoyed the sunset ride overlooking Kilimanjaro, hundreds of elephants crossing a road in front of us and empty roads with no cars around – as if we were alone in Amboseli NP. 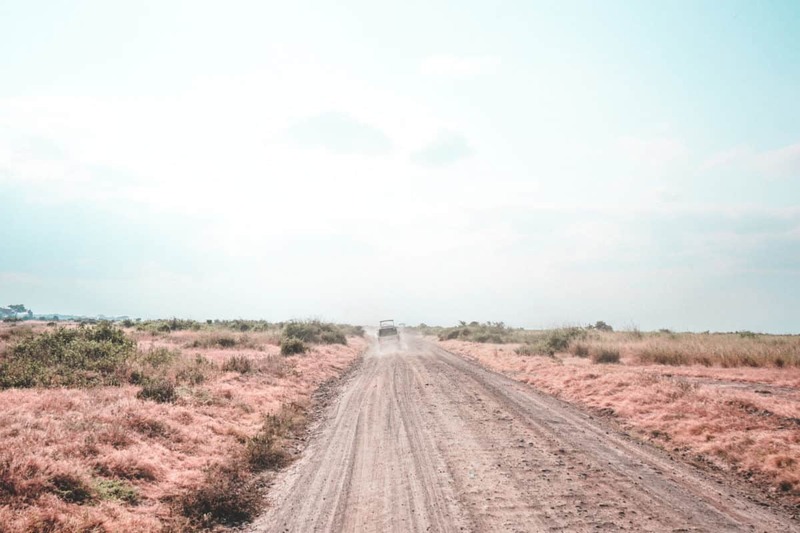 On the third day of our trip, we actually headed all the way to the Kenyan – Tanzanian border (took us about 3 hours from the Amboseli Sopa Lodge) – our safari car wasn’t suitable for such roads. We spent about an hour at the border – we needed a yellow fever certificate and paid $50 per person for a Tanzanian visa. After we crossed, we changed drivers and cars and went off to explore Tanzania in a 4×4 vehicle (finally). Looking for holiday ideas? My best holiday ever was in the Maldives. Read this post to find out, when to go to the Maldives and this one to learn how to pick a resort and how the resorts differ! It took us two more hours to get to Arusha from the Kenya-Tanzania border and two more hours to get to Tarangire National Park. It was around 2:30 pm when we entered Tarangire, and as you can imagine, we were already pretty tired. However, Tarangire just blew our expectations with its incredible landscapes, hills, flatlands and lots of animals. We saw a lion family with a cub resting just some 20 meters from us and plenty of impalas, hippos and many other animals. 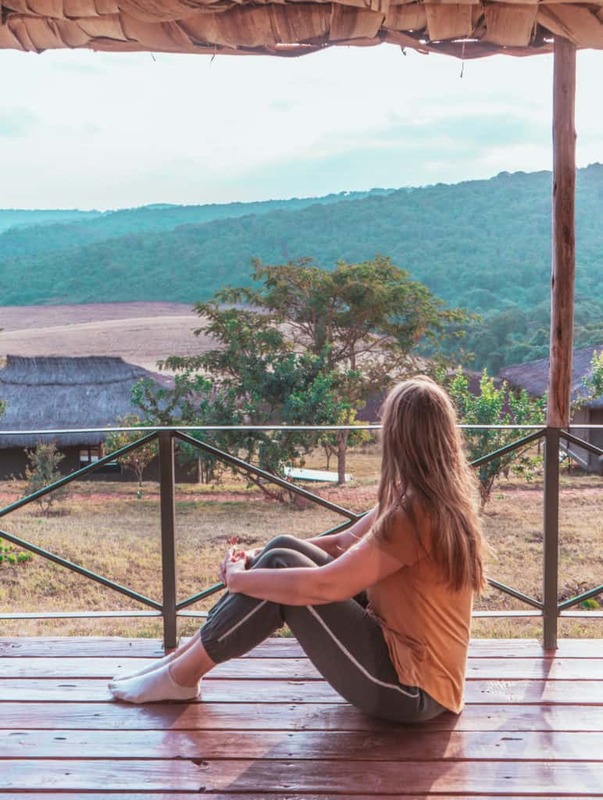 Overnight, we stayed in the most incredible and welcoming lodge in my life – Tarangire Osupuko Lodge that was overlooking a part of Tarangire NP. 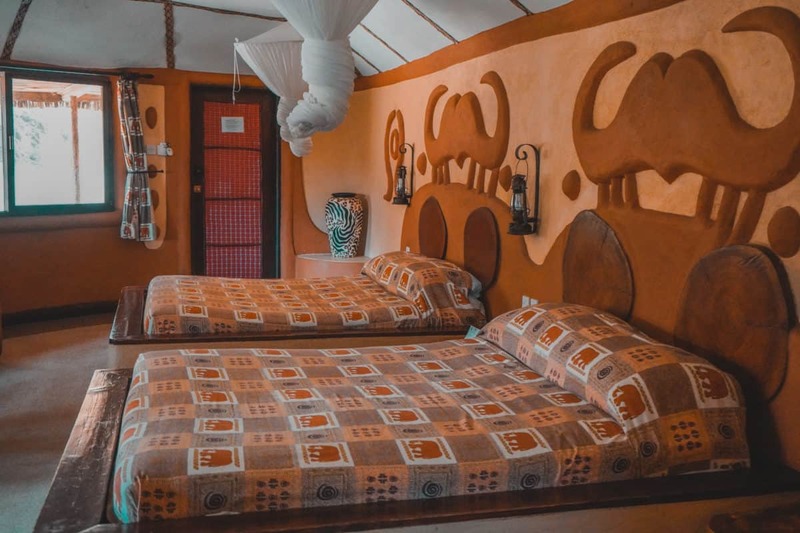 It was located in the middle of nowhere, in a place, where you need to be escorted even to the hotel reception by a Masai Warrior after dart. A place, where we could see zebras casually eating grass from our huge panoramic window. We even had a second shower outside and had to run back in because we thought of a wild boar in the bushes right in front of us. The dinner was terrific, and the breakfast was fabulous as well. We woke up to the elephants being 3 meters away from our bungalow and that was incredible. If I could only recommend you one hotel in the world, that would be Tarangire Osupuko Lodge. On the day 4, we headed to Lake Manyara, which is another National Park in Tanzania, not so far away from Ngorongoro Crater. 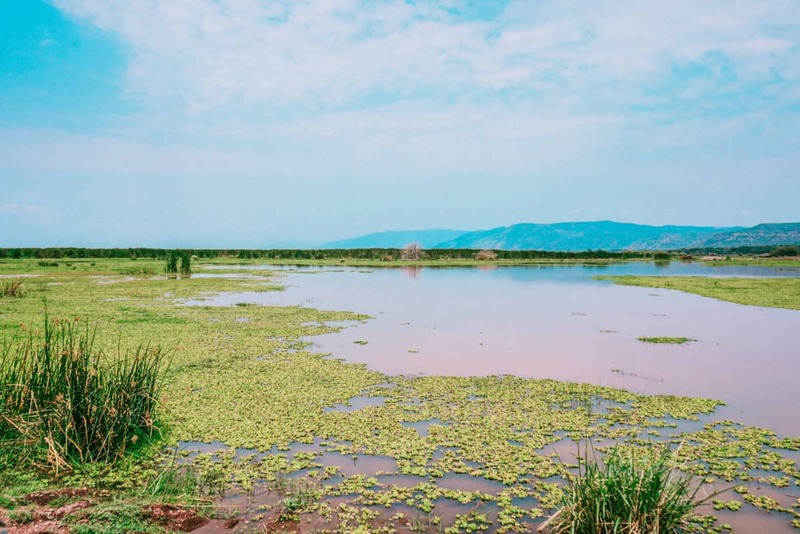 I didn’t have big expectations for Lake Manyara and looking back now, and I think that we should have skipped Lake Manyara at all. It wasn’t amusing at all; it was hard to spot animals apart from baboons, zebras and hippos. 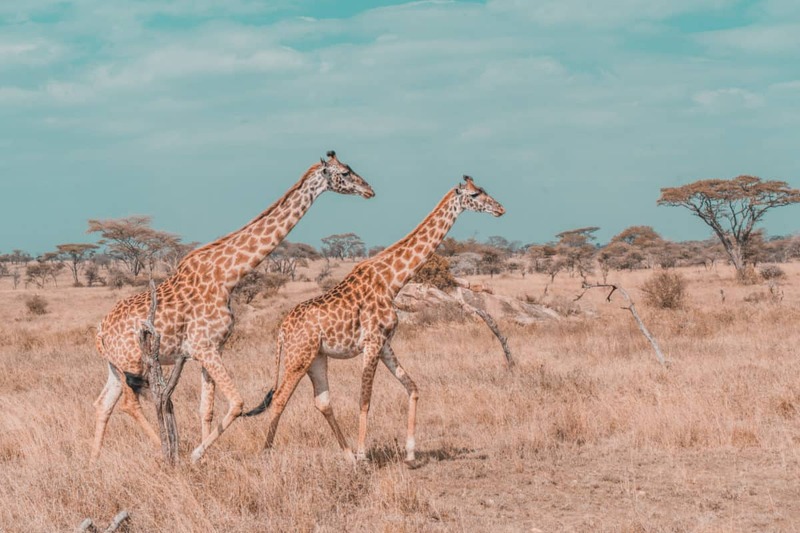 The latter ones were probably the most impressive animals in Lake Manyara, as there was a huge hippo pool – that and the bird watching platform were the only things I liked in Lake Manyara. 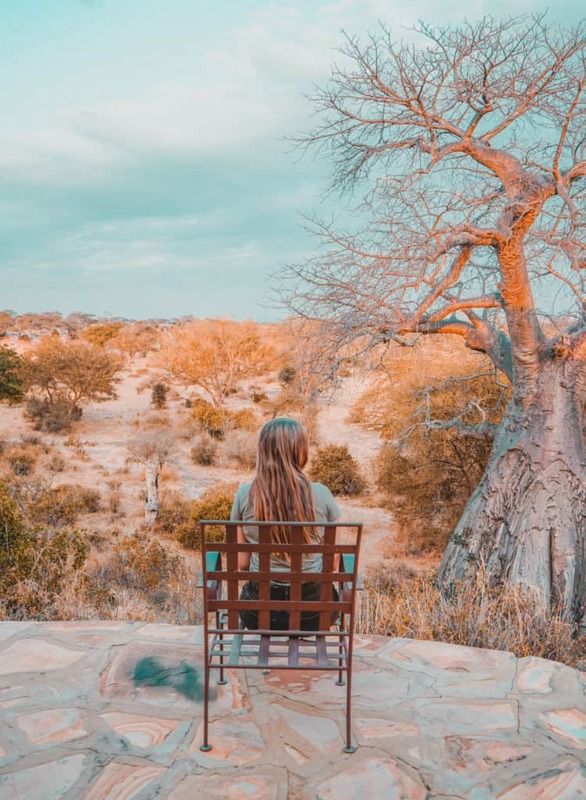 It’s said to be the home of the tree-climbing lions, but during a whole day there we didn’t see a single lion, but we did see a lot of deadly tsetse flies inside our car, which wasn’t great at all. We spent the night in some depressing motel called Twiga lodge & campsite in Mto Wa Mbu, that was honestly quite bad compared to all our other hotels in this trip and which I would never recommend to anyone. The day 5 was honestly so overwhelming for me. I’ve heard about Serengeti when I was a little child, and since then it was some sort of unreachable destination that you can only dream of. I could never imagine that some 20 years later, I will actually visit Serengeti and stay there overnight. How crazy is that? But well, it happened, and it made me the happiest human. The moment we entered Serengeti NP, I was delighted, attentive and just looking forward to seeing the beautiful endless plains. We were so lucky to see a leopard sitting on a tree just 10 meters away from us, a pack of lions also quite close to the car and of course, plenty of hyenas, buffalos, exotic birds and impalas. What we didn’t see were wildebeest and zebras as all of them already migrated to Masai Mara (a gem we didn’t see). 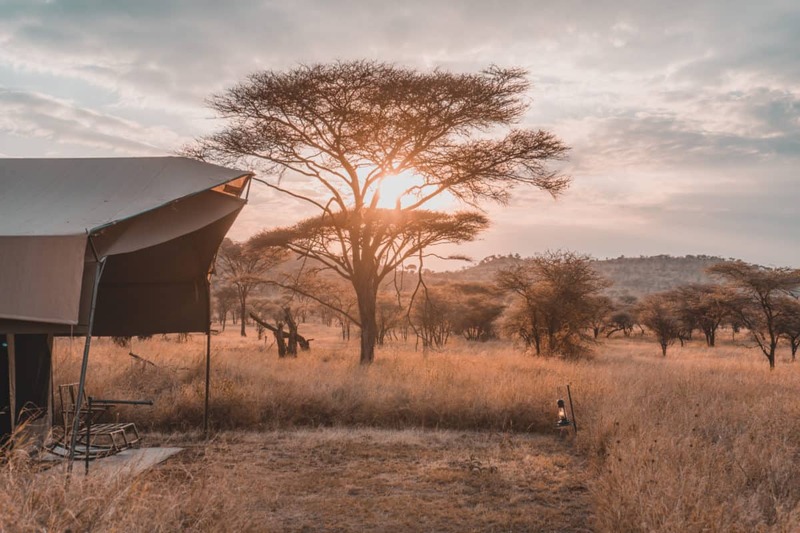 We stayed in a luxury tented camp called Osupuko Luxury Tented camp, and it was terrific. We had a tent for 3 of us, and the tent even had a toiled (like a real toilet that could flush) and a shower. Now, the shower was a bit strange, because there always had to be a hotel staff member outside the tent, emptying the “bucket” of water for you or something like that. The tent was honestly very comfortable, but it was very windy at night, so some of us who didn’t want to wear ear plugs, actually couldn’t sleep all night long. For some reasons, there were metallic hooks on the inner sides of the tent and with every blow of wind, they would hit our beds, and it was quite noisy. We had to cover them with all the towels we could find. The food was honestly amazing in the tented camp – pumpkin cream soup, warm bread, tender lamb, chicken, some salads and even a dessert. The day 6 was the last day of the safari, but we still had 1.5 days left to commute back to Nairobi. So the first half of the day six we spent crossing Serengeti, crossing Ngorongoro national reserve and getting down to our final destination, the Ngorongoro crater. It was freezing down there in Ngorongoro crater, and I regretted not bringing a puffer jacket. If you have Ngorongoro in your itinerary, bring a lot of warm things, maybe even a hat, because in the morning (and it was already 11 am), it’s still quite cold! Ngorongoro crater is famous for its black rhinos, but unfortunately, we only saw one very very far away, so technically didn’t see any. 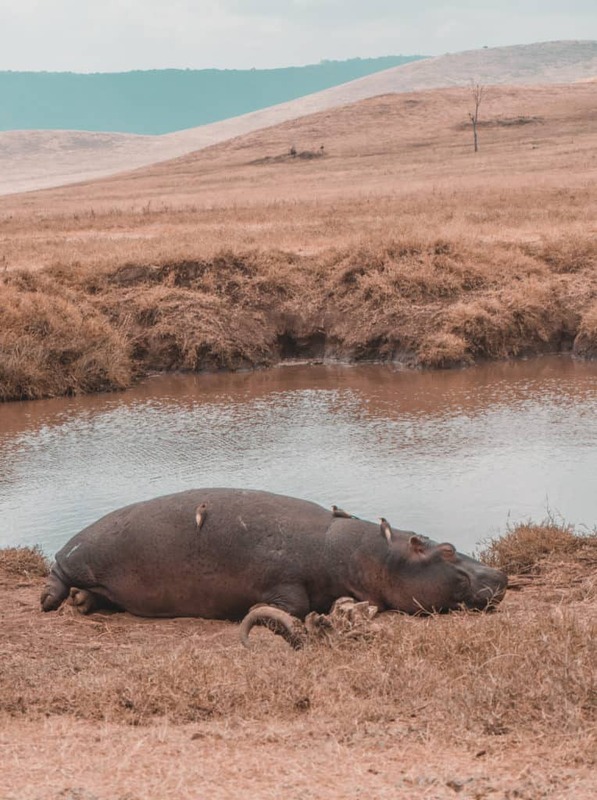 Ngorongoro Crater NP has a great picnic area just next to a hippo pool, so you can have your sandwich in front of the hippos, which is excellent. 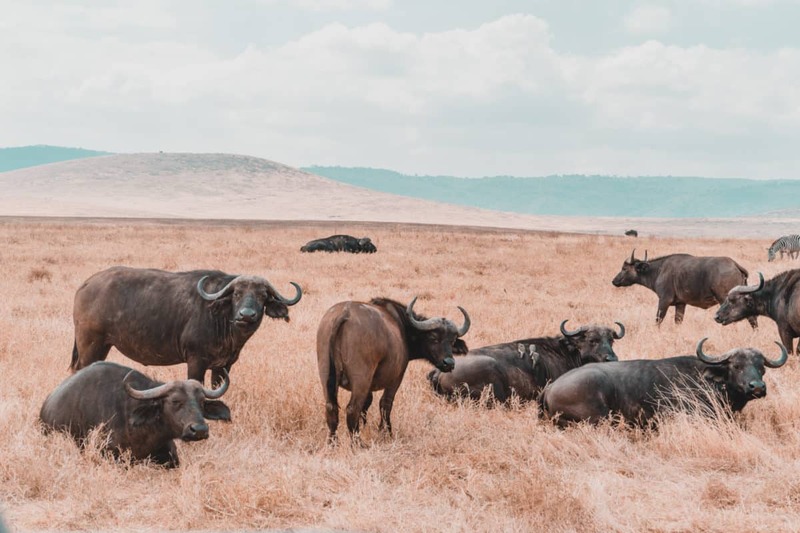 Also, Ngorongoro crater had an insane amount of buffalos that looked great and zebras, wildebeest and plenty of other animals. Ngorongoro landscapes weren’t as impressive as Amboseli or Tarangire, but I’d say it’s worth to go there, as there are plenty of animals. Also, we saw two lions very close to us, awake, waiting for zebras to come closer to start hunting them. The downside of Ngorongoro is the fact that it’s very crowded and if you see 50 cars in 3 lines trying to get to one particular spot, it almost always means lions or rhinos or something going on. Last night of our safari tour we stayed in a beautiful panoramic lodge called Karatu Simba lodge. The hotel was great, but for some reason, the staff wasn’t as friendly as everywhere else. Also, the food was honestly too much – the portions were way too big, and almost no-one could finish them! On the last day, we drove all the way to Arusha and bought some souvenirs on the way to the city. We even went to the African gallery to see how Tanzanite (the gemstone of Tanzania) is produced and were quite impressed by the prices of it. Also, if you’re buying souvenirs in Kenya or Tanzania, make sure to bargain very well, as the price could be negotiated to 30% of the initial price. In Arusha, we took the Riverside shuttle to Nairobi airport, it was £27 per person and honestly, it felt like such a rip off, as it was an old bus, absolutely full of people (we were the only tourists) and there were seats even in the aisles (have you ever seen that). All the luggage was kept on the roof, and honestly, the level of comfort in this bus was like 0. Instead of 5 hours, it took us 7.5 to get to Nairobi, because some person was detained on the border for like an hour and then we stopped in front of some random shop and stayed there for an hour. The shuttle also couldn’t leave us in our airport hotel (while it was actually passing it) but dropped us on the other side of a huge avenue at night. So well, try to pick other company, because riverside shuttles are not the best option for getting from Arusha to Nairobi by bus. We stayed overnight in Hilton Garden Inn (again) and were ripped off by an Uber on the way to the airport next day. The driver, who delivered us to the airport, didn’t end the ride and drove almost all the way to the Tanzanian border, so I was charged quite a lot. Luckily, I was able to file a complaint, so the money was returned to me (apart from £4.5 spent on the actual ride). In case you’re taking an Uber in Kenya, always make sure that your driver finishes the ride unless you want to file claims later. Overall, I really enjoyed our trip and loved exploring Kenya and Tanzania. In general, people were very kind and friendly to us and seeing wild animals in their natural habitat was pretty awesome! Some of the hotels we stayed in, will remain in my memory forever, as they were amazing. I would definitely recommend you going on a safari at least once!